--- I hope JFS-Kids helps inform the younger generation as well as adults enough that they are inspired to do something more in order to preserve our world for future generations of animals, plants, microbes and even humans to come! 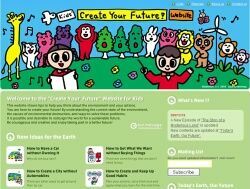 --- Congratulations on the launch of the Kid's Create Your Future Website. What a great idea! It calls kids to positive action! --- I was surprised that the site covered so many topics. The articles are easy to read. The illustrations are colorful and have a friendly feel too. I especially liked the fact that it gives new and realistic ideas for an earth-friendly lifestyle. I also like the feedback section at the end of the articles.